Fill a large bowl with ice and water. Slice one lemon and add to the water. You can place cut artichokes in the lemon water to prevent browning. Prepare artichokes. Use a sharp knife to cut off top third of each artichoke and trim stems. Remove large outer leaves until you have mostly softer yellow and pale green leaves. Cut each artichoke into quarters. Remove the sharp inner leaves and fuzzy choke. Place into the bowl of lemon water. Place the trivet into the bottom of the Instant Pot. Add wine to the bottom of the pot. Arrange artichokes on a steamer basket. Place the steamer basket into the Instant Pot on top of the trivet. Close the lid and make sure the steam vent is set to "Sealing". Press "Manual" then press "Pressure" until the Instant Pot is set to "High Pressure." Adjust the +/- buttons to set the timer to 10 minutes. Cook. Once timer goes off, carefully turn the vent to "Venting" (away from your hands and face) to release pressure until valve has dropped. Open the lid and carefully remove steamer basket and trivet with a pair of tongs. Add garlic, capers and 1 tbsp lemon juice to wine in the bottom of the pot. Press "Sautee" until Instant Pot is set to "Normal." Use +/- buttons to set the timer for 10 minutes. Cook wine down for 8-10 minutes or until slightly reduced. Press "Cancel" to turn off Instant Pot. Arrange artichokes on a platter. Drizzle wine sauce with capers and garlic over artichokes. 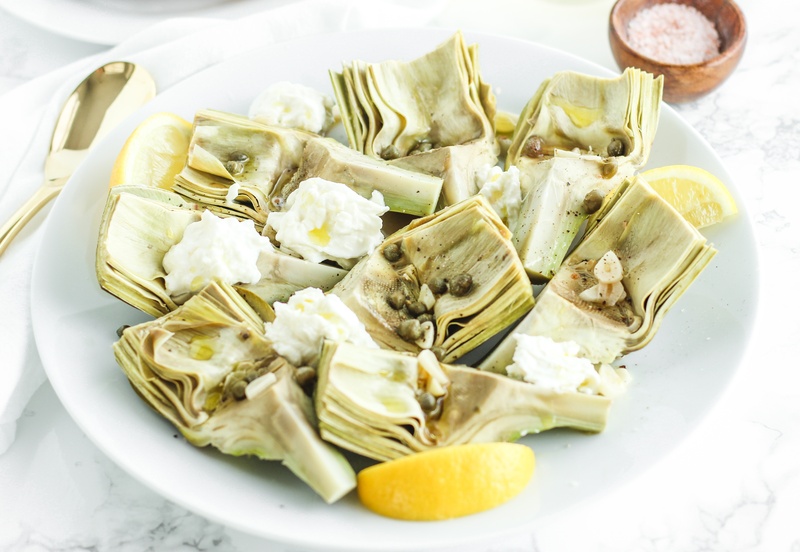 Arrange pieces of burrata around artichokes and drizzle lightly with olive oil. Sprinkle with salt and pepper to taste. Serve with lemon wedges and toasted bread or on top of pasta.